A baby bullet train making 5-6 stops will make the SF - SJ trip in 45 minutes, down from 60 minutes today. A train making the SF - SJ trip in 60 minutes will be able to stop 13 times, up from 6 stops today. Both of these claims are greatly inflated. They are easy to verify using a computer program known as a train performance calculator, which numerically integrates the differential equations of motion of a train based on the known characteristics of the track (vertical profile, curve, speed limits, station stops, etc.) and of the train (power, weight, tractive effort, drag, etc.) Physics and math can predict timetable performance quite accurately. Here is what a typical baby bullet run looks like today, with an MP-36 diesel locomotive, six Bombardier coaches, and a load of 600 passengers. There are five stops in this example, each lasting (very optimistically, as riders will attest) just 60 seconds. The pure run time from San Jose to San Francisco 4th and King is 52:22 under ideal conditions, without any margin or padding that is added to a real timetable; compare to the weekday northbound timetable at 64 to 67 minutes, or up to 25% longer (!) than the pure run time. Note that the weekday timetable has been extensively padded lately due to crowding; in 2012, the same run was timetabled at 59 minutes with 12% padding. All other things being equal, let's substitute an EMU train for our slow diesel. The same run drops to 48:15, just four minutes quicker. This isn't surprising: baby bullet trains spend most of their time cruising near the speed limit, where the faster acceleration of EMUs doesn't provide a benefit. With all other things being equal (including crowding and long dwell times--why would electrification resolve these?) we can expect the timetable for our five-stop baby bullet to drop by the same four minutes, or 60 to 63 minutes. That is a full 15 to 18 minutes slower than claimed by Caltrain! Even if you remove the copious 5-8 minutes of extra padding present in today's timetable and compare to the 2012 timetable, we're still 10 minutes slower than claimed, at 55 minutes. How could you possibly get to 45 minutes? One approach is to raise the speed limit to 110 mph, which is planned in the long term but clearly outside of the scope of the electrification project. Changing only that variable, and slowing down as needed where curves limit the speed to below 110 mph, our EMU now makes the same San Jose to San Francisco run in 41:32, almost seven minutes faster. 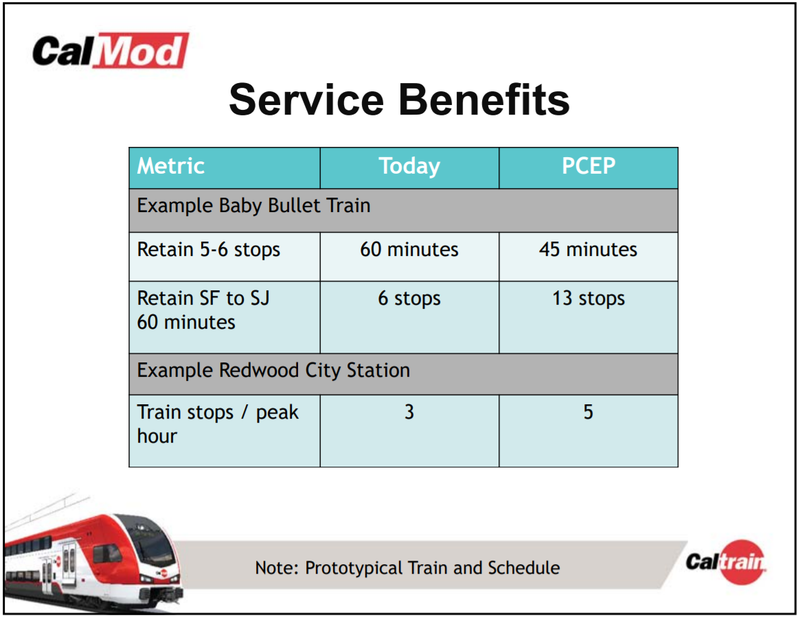 However, we're still 7 to 10 minutes slower than Caltrain's 45-minute claim, or 2 minutes slower when using 12% padding. Again, the reasons for having such enormous amounts of timetable padding will not suddenly disappear after electrification! The best way to get there is with level boarding, which alleviates Caltrain's crippling dwell time problem. Level boarding has two benefits: the primary benefit is in the form of reduced dwell time during each stop, and the secondary benefit is in the smaller amount of timetable padding that is needed, thanks to the improved schedule adherence that is possible when the occasional wheelchair lift deployment no longer threatens to inject random three-minute delays. Padding could conceivably be cut to 7%, and dwell time to 30 seconds. No new simulation runs are required-- our five-stop 79 mph EMU makes it in (48:15 - 2:30)*1.07 = 49 minutes on the timetable; the 110 mph EMU makes it in (41:32 - 2:30)*1.07 = 42 minutes. To promise a 45-minute baby bullet run in the short term is at best misleading and at worst a flat-out lie. Once the electrification project is complete, we can expect approximately zero improvement in baby bullet performance, with timetabled runs in the range of 64 to 67 minutes. If the initial slight increase in capacity of the electrification project relieves crowding (but will it, enough to offset the performance loss from dragging a seventh Bombardier car?) then we could return to the 2012 timetable performance of 59 minutes. Let us assume for the moment that padding returns to the 2012 level of about 12%. Assuming 60-second dwells and a 79 mph speed limit, how many intermediate stops can a limited train make between San Jose and San Francisco before the timetable hits one hour? Subtracting 12% pad from one hour, we need to make a pure run time of 53:34. Case D shows that the maximum number of stops permissible under post-electrification conditions is at most 8, just two more stops than today, and not 13 as claimed by Caltrain. Only after level boarding does the number of stops increase to 13 as shown by Case J, but once again, level boarding is not included in the scope of the basic electrification project. Case K illustrates the diminishing returns from increasing the speed limit to 110 mph; the more stops a train makes, the less benefit there is from the higher allowable speed. Case K (see diagram at right) shows the train almost constantly accelerating and braking, which is not how one would choose to operate given the cost of electricity in the real world. 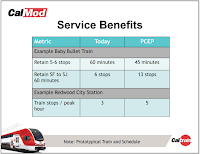 The takeaway message to Caltrain is this: don't over-promise and under-deliver on the modernization project. Your electrification project reduces time in motion and establishes a foundation for further improvements, but is not sufficient by itself. To deliver the service benefits promised in your public presentations, you absolutely need level boarding to reduce time at rest. Zero trains per hour (tph) is the inaugural Caltrain service level at San Francisco's new Transit Center, which opened to the public today after a decade of construction. The grand opening of the center, with its expansive $400 million basement featuring ghost tracks, ghost platforms and a ghost passenger concourse will no doubt crystallize the increasingly urgent transportation need for the downtown extension (DTX) of the peninsula rail corridor. Only then will train service increase beyond the current level of zero tph. Huge opening day crowds at the Transbay Transit Center. Photo by Adrian Brandt. Simple. Within a half mile radius of the Transit Center, there are more jobs than within a half mile radius of every station along the peninsula rail corridor from San Francisco 4th and King all the way to Gilroy, COMBINED! Even before high speed rail shows up, this is a piece of infrastructure that makes perfect sense. Or does it? The clear (and, as of today's opening, agonizingly present) need for the DTX sets up a deliciously fat and juicy prey for the transportation-industrial complex, which you can think of as a hungry snake. Here we are, in a strong economy, in one of the richest cities on Earth, facing a specific and obvious transportation need: they can name just about any price. The latest estimate for the biggest meal that the snake can swallow is six billion dollars, and that's only the start. Scope creep, dizzying amounts of contingency cushioning, and construction change orders are sure to drive it far higher. Civil engineering megafirms, labor unions, and complacent and poorly coordinated government agencies are salivating at the prospect of feasting on the DTX. The bigger it gets, the more sated and comfortable everyone will be, with the notable exception of the suckers who pay taxes and ride trains. "It is difficult to get a man to understand something, when his salary depends on his not understanding it." This insight by Upton Sinclair applies to any attempt to reduce the scope or optimize the cost effectiveness of the DTX project. There isn't and probably won't be a true will to do it, but in a pretend world where the interests of taxpayers and riders came first, where might you start cutting scope? Delete the Pennsylvania Avenue tunnel extension. There is a perfectly serviceable tunnel already available. Engineering acumen should be brought to bear to overcome the (otherwise delightfully profitable) constraints of building a new trenched grade separation by figuring out how to shore up I-280 during excavation; how to cross the SFPUC's giant new sewer; how to duck under 16th street using a steeper 2.5% grade than the train people would prefer; and how to build temporary "shoo-fly" tracks under I-280 during construction now that the area is hemmed in by fresh UCSF construction. The usual paint-by-numbers engineering that deploys freight train design standards as "constraints" shows this to be categorically impossible, but is it really? Sharpen your pencils. Delete the mezzanine level at 4th and Townsend. Station mezzanines are a knee-jerk (and delightfully profitable) design feature of every recent piece of rail infrastructure in the United States. Wedged above the tracks, underneath, in the sky or in a cavern, mezzanines tend to sprout everywhere. In this case, a mezzanine makes passenger access more circuitous and pushes the track level much deeper, increasing the depth of excavation. The mezzanine and station become an enclosed underground space, triggering an avalanche of fire safety requirements that greatly increase cost and complexity, with all manner of vent structures and evacuation shafts. The right answer is simple, direct and free-flowing access from platform to street, and an open station ceiling that vents to the street through a slot built into a raised median on Townsend Street-- as wide as necessary to treat the structure as an open station under fire safety regulations. Daylight as much of the shallow Townsend Street portion of the alignment as possible, with a central median vent slot (just like in Los Angeles on the Alameda Corridor, where three of the nation's busiest diesel freight tracks are concealed beneath the street with a vent slot as narrow as six feet). This configuration has the potential to simplify the engineering considerations and costs related to fire safety, and even improves rail operations: without the onerous fire safety requirement of having only one train at a time occupy each tunnel ventilation section, operation of the entire DTX becomes less constrained. Slim down the three-track tunnel, another one of Sinclair's salary considerations, to two tracks instead of the planned three. The Rail Alignments and Benefits (RAB) operations analysis, carried out by a premier Swiss rail operations consultancy, concludes on page C-68 that "Under normal conditions, only two tracks are required in the tunnel leading up to the TTC to operate the analyzed service plans. More detailed analysis is recommended to identify the most effective approach to provide infrastructure redundancy (e.g. the proposed third tunnel track) to help mitigate the potential effects of major service disruptions." The clear implication here, artfully worded so as not to upset Sinclair's salary men, is that a third track is not necessarily the best or only approach to achieve infrastructure redundancy. Add three 400-meter underground storage tracks, feeding in towards the Transit Center instead of the peninsula, along the northwest edge of the existing 4th and King station footprint. The fire safety requirements for this underground infrastructure would be less stringent because it would not be occupied by passengers. With beefy foundation columns bored down to bedrock to straddle this yard, the entire footprint of the site can still be redeveloped above grade, safeguarding San Francisco's desire to use "value capture" from this increasingly coveted parcel to finance DTX construction. The resulting train storage capacity is far more conveniently located than the remote yard sites currently proposed at Oakdale or Bayshore, reducing long-term operating costs. Even skyscrapers can be built on top of train storage: see Hudson Yards. Rationalize the Transit Center approach tracks to speed up train movements. The throat of the station has been identified as a key bottleneck for train movements (see RAB operations analysis page C-96, "Key Findings of Conceptual Planning"--and recall that you read it here first). An optimal layout has been identified that better enables concurrent arrivals and departures of two trains (see page C-117 of same). Precious seconds saved in the station approach can increase the traffic capacity of the DTX and make it more resilient to disruptions. Don't use exotic and expensive tunneling methods when their sole purpose is to keep businesses along the DTX route healthy during construction, by avoiding cheap but disruptive cut-and-cover methods. The intent is noble, and the recent impact of Central Subway construction in Chinatown is painful and fresh in our minds, but this sort of thing rarely pencils out for anyone but Sinclair's salary men. Only after a draconian cost cutting exercise might it begin to make sense to build the DTX. At a price point of six billion dollars for a couple of miles of tunnel, we regretfully should keep service levels at zero trains per hour.